I finished my first block last night for the quilt along that I am participating in, and I just LOVE it. I danced around the house showing it to my people and of course, since they are all of the male species, I received nothing more than a tepid "oh, cool". Ahh the frustration to be the only female in a household! Sorry about the quality of the photo. One of these days I will do some research to figure out to take better photos to publish online. 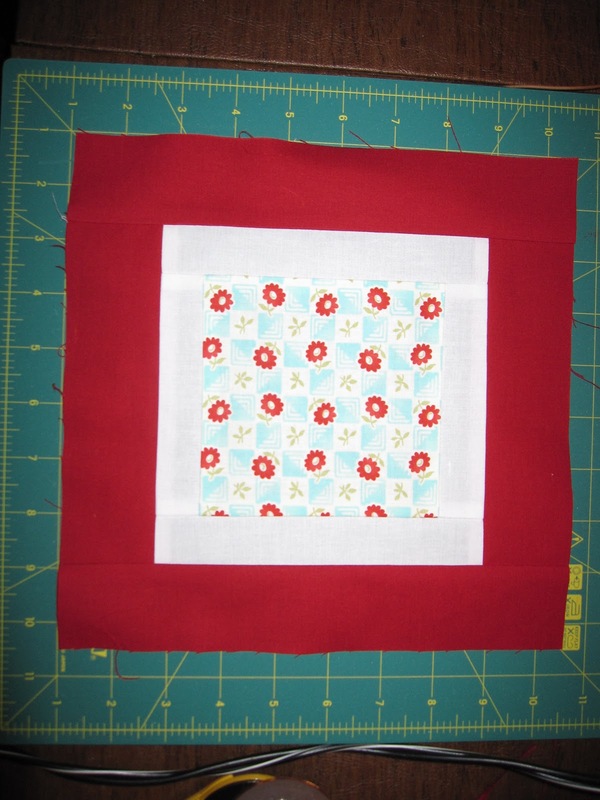 Three full blocks are done but I do have the rest of the charm squares outlined in the white. I've got to get back to the books so finishing the rest up with the red will have to wait until Friday. Off to make Clam Chowder with Sourdough Bread for dinner. It is actually cold here (ok, cold for us - don't laugh!) so soup just feels right. I'm falling for the red too! It's beautiful! Yea! I've got Bliss too, but you're way ahead of me! Need to get started... BTW, TOTALLY get you. I'm the only girl in the family too (2 boys, and DH). Even the dog is a boy. But we do have a girl kitty. She loves my quilts ;-). Ooooh, I'm digging the red, that looks awesome. 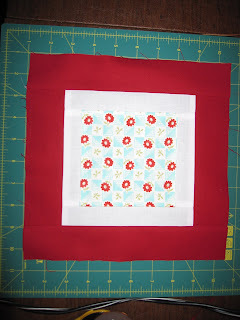 I haven't gotten to the aqua part of my quilt blocks just yet, I'm already falling behind! I'm the only girl in my house, too, outnumbered by my husband, son, dog and cat, too! I'm thinking that we "outnumbered women" should stick together! In my house, I am outnumbered by a husband, two sons, a dog & a turtle! I keep saying we need a girl dog to help me keep the guys in line... but that's going to be awhile, and I'll probably get to the pound and find another wonderful boy pup to bring home instead! You all rock! Becky - I had to read your comment to my boys as I just cracked up at the girl kitty part. You all have male pets too - I guess I'm glad we don't have any pets. hehe.